this important statistical area. Like its highly acclaimed predecessor, the revised edition, along with its companion ftp site, aims to equip students with the conceptual and technical skills necessary to select and apply the appropriate procedures for a given situation. An extensive array of examples drawn from actual experiments illustrates clearly how to use nonparametric approaches to handle one- or two-sample location and dispersion problems, dichotomous data, and one-way and two-way layout problems. Rewritten and updated, this Second Edition now includes new or expanded coverage of: * Nonparametric regression methods. * The bootstrap. * Contingency tables and the odds ratio. * Life distributions and survival analysis. 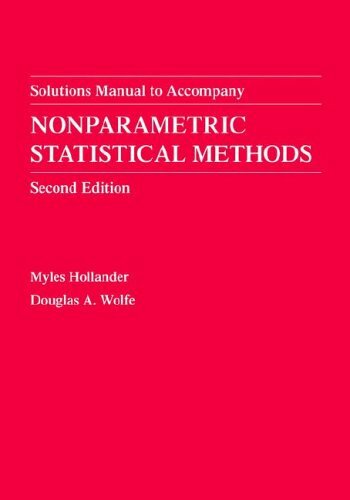 * Nonparametric methods for experimental designs. * More procedures, real-world data sets, and problems. * Illustrated examples using Minitab and StatXact. An ideal text for an upper-level undergraduate or first-year graduate course, this text is also an invaluable source for professionals who want to keep abreast of the latest developments within this dynamic branch of modern statistics.